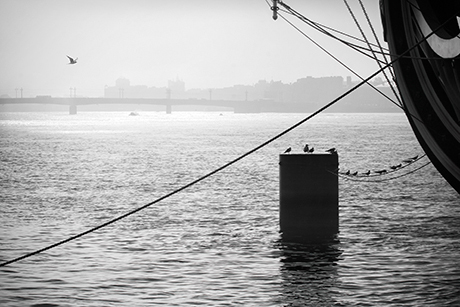 Morning water landscape of Petersburg at Neva River. Nautical minimalist black and white art poster. Printing on Pearl Paper with a matte finishes creates an impressive effect: the picture is filled with an internal soft light and changes its own lighting from different angles of view. Print in black and white version has a silvery effect.